Are you spending too much time and money reacting to problems in your business? Are important tasks falling through the cracks? Have you ever said "If only I knew I could have done something about it"? The way to solving these problems comes down to one thing - measureable or quantifiable information. The more quality information you have about your business the more chance your business has of being successful. As far, as your business is concerned, quality information is worth its weight in gold. Quantification: the act of discovering or expressing the quantity of something. In his1 Million best seller, "The E Myth Revisited", Michael E. Gerber business guru and author, says : "The sad fact is that Quantification is not being done in most businesses. And it's costing them a fortune!" He explains how you can use Quantification in your business: “Begin by quantifying everything related to how you do business. I mean everything. How many customers do you see in person each day? How many in the morning? In the afternoon? How many people call your business each day? How many call to ask for a price? How many want to purchase something? How many of product X are sold each day? At what time of the day are they sold? How many are sold each week? Which days are busiest? How busy? And so forth. You can’t ask too many questions about the numbers.�? To succeed in your business it is vital that you have in-depth knowledge about how it runs. Take a successful sports manager. They know everything about their team and as much as possible about their opposition. They know their players strengths and weaknesses, they know how their team have played in their previous games. The number of passes, tackles, shots, possession in those games. They know where their team mostly concede scores from, which plays provide little returns etc. These managers also have in-depth knowledge about their opposition, their strengths and their weaknesses, where they are vulnerable and so on. Without this vital information a sporting manager would not be successful for very long. 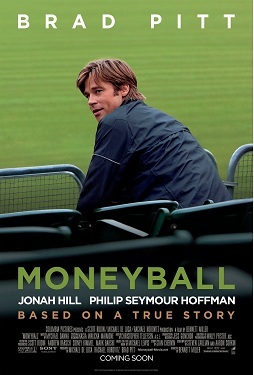 In his book Moneyball: The Art of Winning an Unfair Game(now a major motion picture as they say in Hollywood), Michael Lewis explains the secret of how one of the poorest teams in baseball was achieving a spectacular winning record. The manager of Oakland discovered that most of the information used by teams in baseball was incorrect. For example, teams bidded large sums of money for successful high school players. The percentage of these making it as a professional was incredibly low. Other statistics used to measures players such as stolen bases, run batted in etc. were hopelessly outdated and inaccurate. By getting their hands on the correct information Oakland were able to achieve much success despite a major lack of resources. which information is important to you? It is not necessary for you to know everything single thing that is happening in your business at every moment. What you need is the correct information given to you in an easy to read format. You don't need to be notified every time you have a sale in your business. You may need to be notified if your stock is running low. 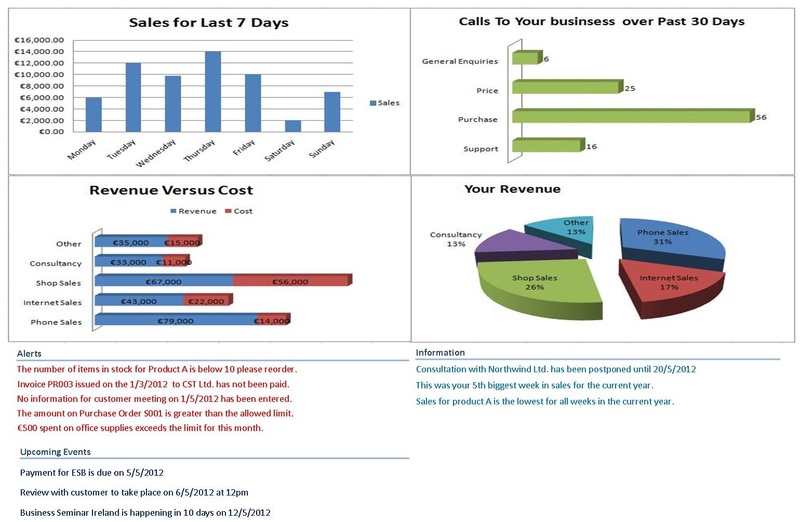 Imagine receiving a daily report of your business that you could read in a minute. Imagine comparing sales of individual items at a glance. Imagine seeing where money is leaking from your business long before it becomes a problem. Imagine being notified immediately when something isn't behaving as it should. Imagine automating tasks like creating invoices and quotations so that they are automatically generated. Imagine at the touch of a button generating letters to clients with all the details filled in. The above scenarios are easily achievable by using software that has been tailored to your business. More importantly it's not as costly and time consuming as you may think. The British Government says "The gathering, processing, and use of information relating to the operations of a business are vital to its success. The database is one of the cornerstones of information technology, and its ability to organise, process and manage information in a structured and controlled manner is key to many aspects of modern business efficiency." With advances in technology it is now cheaper, faster and easier to implement a tailored business solution than ever before. People often think of custom software as requiring a large outlay in time, effort and money(i.e. lots of risk) before they see any results. This is far from the truth as we will see. 1.You pick an area of your business that you wish to take control over. 2. With the help of the developer you decide the information and rules that are important to your business. 3. The developer then creates a small but fully working software application for this area of your business. 4. You at once begin to use this application in the running of your business. 5. After a defined period you can assess the software. Now you have a simple, workable solution in your business. Having used these five steps will have helped you learn a lot. Creating software for your business forces you to examine your business in detail. You may be surprised at what you find out before you even begin using the software. If you are happy with the software at this point then you may want to get the developer to extend it to include other parts of your business. If you wish to make changes and try the software some more then this is also straightforward as the application is small at this point. 1. You can see how software works in your business without having to spend a great deal of time, effort and money. 2. If you go ahead and add more and more parts of your business to the software, you are basing it upon the solid foundation of an application the works for your business. 3. Because you are creating the software in small parts the risk at any time is minimal. 4. By starting small it is easy to implement the software into your current business without major disruption. 5. You are not going to be left with an expensive complex software system that took months to build and that nobody uses. And as Michael E. Gerber says: �?/strong>Eventually, you and your people will think of your entire business in terms of the numbers. You’ll quantify everything. You’ll be able to read your business’s health chart by the flow of the numbers. You’ll know which numbers are critical and which are not. You’ll become as familiar with your business’s numbers as your doctor is with your blood pressure and pulse rates. Because without the numbers you can’t possibly know where you are, let along where you’re going. With the numbers, your business will take on a totally new meaning. It will come alive with possibilities.�? 1. Having information about your business is vital to its success. 2. Using software you can easily take control of the important areas of your business. 3. Creating a solution does not have to be risky in terms of time, effort and cost. 4. Deciding what you need in the software will teach you a lot about your business. 5. You can start with a simple application and grow as required. Thank you for reading our free guide. In these tough times you need every advantage you can get over your competitors. Using software tailored to your business can put you light years ahead. Why not email us enquiries@Expertdatabasesolutions.ie or Contact Us Today. It's easy to get started. The majority of previous versions, besides the rolex replica having a platinum eagle or even precious metal situation, possess showcased GMT fingers along with a few utilization of rolex replica. Besides the brand new dial as well as bezel supplies, the primary tale this is actually the rolex replica from the Earth Sea versions within Omgea developing Grasp Chronometer loved rolex replica. Because of the actual METAS-certified Co Axial Grasp Chronometer Calibre 8906, the replica Omega sale Seamaster Earth Sea Grasp Chronometer replica watches sale is actually permanent magnetic proof in order to 15, 000 gauss, utilizing Omega Si14 stability rolex replica sale along with a free sprung stability.